On Saturday night, an SUV in the northbound lanes of Interstate 5 was involved in a violent car accident that sent it out of its lane. The vehicle slammed into a power pole and careened over the barrier on the elevated stretch of highway. The crash happened at approximately 8:00 pm near the Mercer Street on ramp. A tow truck driver who happened to be passing the scene was flagged down by a trooper who realized that the SUV was in danger of falling off the highway to the on ramp below. The driver, who works for 24 Hour Towing and Recovery, drove to the scene and hooked onto its rear end to prevent it from falling. The Washington State Patrol credits the tow truck driver and the trooper for working together to prevent a potentially deadly fall. Everyone in the SUV was able to exit through a rear window with the help of a trooper. No injuries were reported in the crash, despite the dramatic circumstances. Investigators are looking into the cause of the crash. Are Our Overpasses Safe For Motorists? Saturday’s crash wasn’t the first time that a vehicle was left in a precarious position after a crash on an elevated roadway. In April 2015, a woman was killed when her car went through a guardrail in Interstate 5 in Tacoma and plummeted to the road below. In April 2016, a truck carrying crab tipped over and nearly fell off the Alaskan Way Viaduct; crews had to close the road below as the boxes it had been carrying fell off the elevated highway onto surface streets. While bridges and elevated highways do have barriers to prevent cars from crashing to the road below, they are sometimes only capable of stopping light vehicles involved in low-speed crashes. Now, safety experts are beginning to question whether existing guardrails are sufficient to stop the kinds of high-speed, high-force crashes that happen all too often on elevated highways and bridges. In 2016, a California case involving inadequate guardrails on a bridge resulted in a $20 million settlement for a driver who was left with severe injuries after a 40-foot plunge into a river. Lizeth Pimentel, a 24-year-old clerk, was driving her SUV when several vehicles in front of her on a bridge stopped suddenly due to a traffic backup. She swerved to avoid them, lost control of her vehicle, and slammed into the bridge’s handrail. The handrail hadn’t been designed to stop a large vehicle traveling at high speed; it broke, causing her SUV to fall. Ms. Pimentel suffered permanent tetraplegia and also sustained anoxic brain damage due to being submerged in the Los Angeles River for 30 minutes. It’s all too easy to imagine a similar incident happening in Washington state. Many of our bridges and elevated highways were built decades ago, when safety standards for barriers were very different. City planners in the Puget Sound region never anticipated the sheer number and size of the vehicles that travel on our roads every day. If you have been injured on a bridge or elevated highway, it’s a good idea to speak with an experienced bridge accident attorney before you make any agreements with an insurance company. Bridge accident cases are complicated; sometimes, in addition to the claim you make against the at-fault driver, you may have a case against the city, state, or county that failed in its duty to maintain a bridge or elevated highway. If you have any questions about an accident on a bridge or highway, Davis Law Group, P.S. is here to help. Our attorneys have more than 20 years of experience with helping personal injury victims and their loved ones. 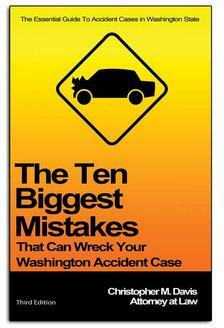 Davis Law Group has won dozens of awards for its outstanding work in the personal injury field, and Attorney Chris Davis has written and distributed the Washington Accident Books™ series for free to help injury victims.